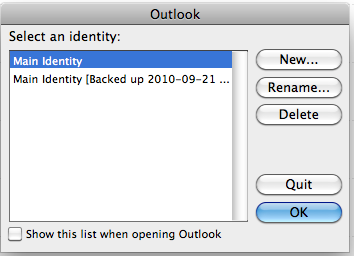 Microsoft’s latest update for Office 2011 is great, some really significant improvements for Outlook especially. Yes, there are improvements for Word and PowerPoint and some bits and pieces for all apps in terms of improved document handling and Lion features, for me Outlook is the biggy. For me it was the Outlook stuff that made me pay attention. In the organisation I work for, we’ve been having terrible trouble with Outlook wanting to do database rebuilds at every opportunity and then when it does, it will pretty reliably duplicate either contacts or calendar entries. We’ve been caning our DPM server doing multiple mailbox restores! Recently we’ve simply been using a piece of freeware to remove duplicates in a Windows based outlook profile instead. As mentioned above, this ha been a real issue for us, not only wasting user time, but also admin time. Time will tell if things are vastly improved, but I thought it was worthwhile to comment on the upgrade process itself. It’s pretty lengthy, when you complete the install of the patch and load outlook for the first time it will prompt you to select which profile you would like to upgrade. This is also good news as you might want to leave a backed up profile alone. One you start the process, it is pretty length and is of course entirely dependant on the size of your mailbox. Be prepared to give up some time to it, you can NOT cancel it once it’s started. IMAP account sync that includes support for synchronising with Gmail is improved. Not tried this as yet, but as a lot of organisations fall in love with the Cloud, reliance on Gmail will inevitably increase. 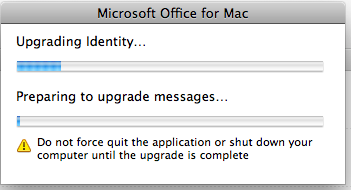 Outlook for Mac performance in key scenarios is improved. So far so good! My Outlook session has been grinding to a halt more and more lately, and since the install I’ve noted a vast improvement in reaction speed and in opening mail items. Exchange email message sync is improved. The scheduling area in the calendar is vastly improved, a picture tells a thousand words, so here’s what it now looks like. Week numbers are added to the calendar display. 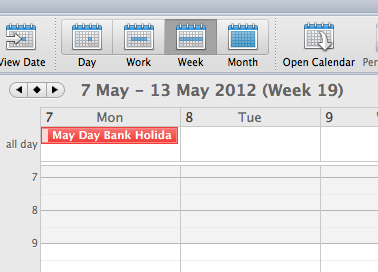 AGain this is configurable, so you can put the week numbers into the Calendar view. It’s not a huge one for me, but I can see how that will be a vast improvement for some people. Distribution list expansion functionality is included. Some of the other bits I liked were the improved 2 line ‘Toast’ email alert, you get a wee bit more info now to make you decision on whether or not to read. In short, this one gets my vote, some proper improvements and some listening has obviously been done by our friends at Microsoft.